ID: 2079 ~ Source: BU Records: NoZe Brotherhood, Accession #BU/384, Box 2, Folder 12, The Texas Collection, Baylor University. 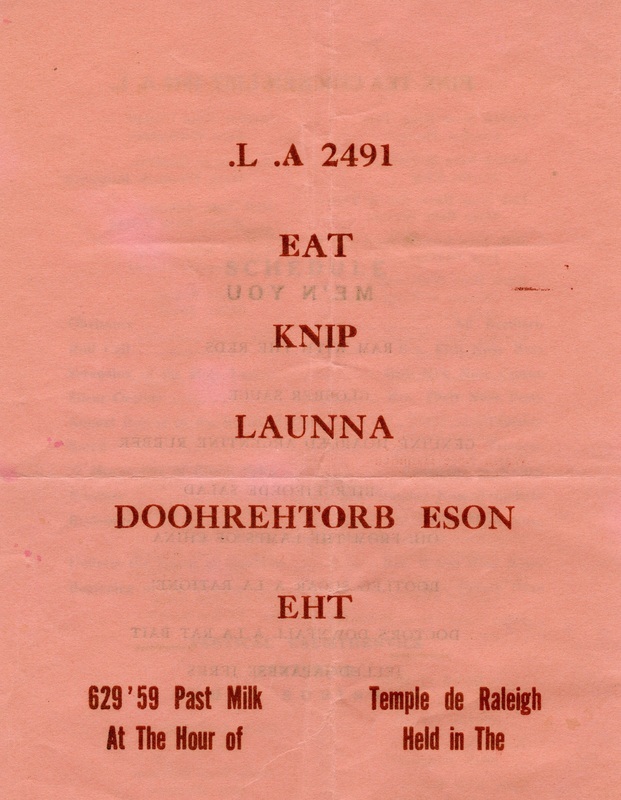 The annual formal dinner of the NoZe Brothers is the Pink Tea, held annually since May 17, 1929. Everything is done backwards; even the meal begins with dessert and ends with salad. The programs are printed in backwards lettering, everyone is told to attend in “informal undress,” and the final speech of the evening is given in a broom closet away from the dining area. And when you would expect applause, only “silent applause” is appropriate, leaving the room eerily quiet.